A Web site for laboratory activities focused on alkali feldspars and the development of perthitic textures is available at http://ipch.yale.edu/sem-eds. Backscatter and secondary electron images, planeand cross-polarized light images, energy dispersive X-ray data (including spectra and results files with data expressed as weight and atomic percents) and X-ray diffraction data are available. Care has been taken to match the areas examined by light and electron methods, allowing students to directly compare the data available from each technique. The information is targeted at undergraduate-level laboratories in mineralogy and petrology. Field-based projects provide a way for students in introductory oceanography to experience the process of scientific inquiry. However, in order to provide genuine field experiences for a class of forty-eight students significant restructuring of a traditional oceanography course is required, together with a substantial investment in field equipment. Course reorganization needs to provide hands-on instruction with field equipment and adequate time in the field to collect data. Moreover, students need to be taught how to design and carry out a scientific study, as well as how to process data and make meaningful interpretations. Necessary equipment includes a large boat, sonar system, laptop computer, sediment, water, and biologic sampling equipment, together with access to lab computers with software for data processing, plotting and map making. To assess skills and knowledge I use pre- and post-course concept inventory tests, together with a combination of instructor- peer- and self-evaluations at various stages throughout the project. Assessments compiled over three years indicate that the benefits to students include improved critical thinking skills, an increase in oceanographic knowledge, greater confidence in the use of instrumentation, high interest in field-based projects and positive experiences with the process of scientific inquiry. The main draw back to the instructor is the extensive record keeping that is required. A concept map is a visual representation of concepts and their relationship to each other in a body of knowledge. They show the hierarchy of these concepts and emphasize the links between them. Concept maps are valuable pedagogical tools used to design the syllabus for an undergraduate structural geology course. Their value as an aid to student learning has been widely documented (Novak, 1990), and we have found them particularly suitable in the initial planning of courses such as structural geology where many new concepts are introduced. Concept maps used in the design stage of our structural geology course has resulted in a significant re-ordering of the topics. A more logical sequence begins with descriptive topics (joints and faults) and progresses to more abstract topics (stress and strain and continuum mechanics). The resultant sequence of topics is not that used in most traditional structural geology textbooks. Although it is not necessary for a course to be taught in the same sequence as material is presented in a textbook it is more convenient for students if it does. Earth science courses typically include the concept of geological time. 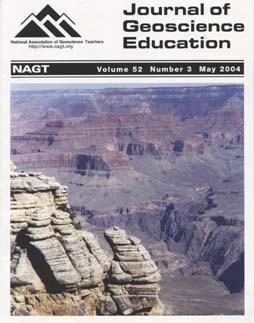 Traditional approaches to teaching geologic time have turned to constructivist methodologies in an attempt to increase student understanding, but these lessons often result in students determining the scale of geologic time instead of gaining an increased understanding of the geologic time scale. Here students create a geologic time scale based on an older adult's life complete with relative and absolute dates for the events in their lives. Students write a reflective paper about the process of constructing the time scale and compare their scales to the geologic time scale. The project is used as a formative assessment which serves to inform instruction, rather than assess students on the project. To that end, students submit project drafts for review and are given immediate feedback regarding improvements to the project. Through this process the teacher gains valuable insight into the direction instruction should take based on common misunderstandings or questions that arise during conversations with students. One of the fastest-growing areas of archaeological fieldwork is the use of subsurface geophysical survey techniques to map ancient remains without excavation. Growing interest in this technology, coupled with the availability of commercial data collectors tailored to archaeological needs, presents a challenge to educators. Specifically, this challenge is to create an integrated, interdisciplinary, active learning curriculum, providing students with: (1) a competent theoretical understanding of basic geophysical processes underlying these survey techniques; (2) an appreciation of the implications these technologies have for research design and methodology and (3) a working knowledge of appropriate mapping and imaging theory and technology. We designed and implemented a course focusing on these outcomes that was taught at the University of Akron for the first time in Spring 2002. This course was offered to advanced undergraduate and graduate students through a cooperative effort between the Geology, Archaeology and Geography programs. Positive outcomes were measured in terms of overall student responses to course content, a dynamic teaching environment for faculty, successful field studies and the placement of students in post-course research projects. At the same time, course logistics, managing student group dynamics and the difficulty in selecting "real" but appropriate test sites warrant further discussion and modification of the course syllabus for future offerings. A scrapbook, in which students assemble news articles, advertising images, postcards, and other flat items has been developed as an assessment tool for an introductory level Earth Science course for pre-service teachers. The students are asked to locate items that relate in some way to Earth Science and to write a relevant caption for each one that demonstrates something the student has learned in the course. The scrapbook can be used to evaluate the breadth and depth of the students' comprehension of Earth Science concepts. The assignment encourages students to relate course content to the world outside the classroom, and to become aware of the relevance of Earth Science to their daily lives. Laboratory exercises incorporating a Scanning Electron Microscope (SEM) encourage undergraduate students to explore geologic concepts and methods. A variable pressure (VP) SEM, with attached Energy Dispersive Spectrometer (EDS) and Electron Backscatter Diffractometer (EBSD), has been used in introductory, mineralogy, petrology and structural geology courses to examine sand morphology, quantify mineral chemistry, estimate the temperature of metamorphism, identify microfossils, and pursue student-designed research questions. Student response to using the SEM has been overwhelmingly positive. The undergraduate students, regardless of course level, tend to master the basics of operating the SEM quickly. After a half hour (or so), most students feel confident enough to take control of the SEM and use it to answer questions, or test ideas. Laboratory exercises are designed to allow students some freedom to pursue their own ideas and hypotheses within the framework of a broader geologic question or concept. An introductory environmental geophysics short course targeted for traditional undergraduate geoscience students but that can be taken also for continuing education credit by practicing professionals is providing satisfying instruction for students via use of magnetometers, electromagnetic (EM) terrain conductivity meters, ground penetrating radar (GPR), direct current (DC) resistivity meters, a seismometer and an automated gravimeter. Geophysical anomaly mapping in this four-day course that is supported by the U.S. EPA and two academic institutions takes place over well-documented features such as movable targets, stationary buried targets and notable geological features. The course may be taken at either 1) a Mississippian limestone karst terrain site at Western Kentucky University (WKU) or 2) a mock hazardous waste site constructed in Wisconsin glacial outwash infilling a paleovalley incised into Silurian limestone at Moraine Valley Community College (MVCC) in northeastern Illinois. Undergraduate students taking this course learn not only content but also of potential employment opportunities because they get exposed to practicing professionals whom also may take this course. In lieu of large-scale curriculum changes in geology programs, this course serves as a model for augmenting existing curriculum by providing a technology-driven, educational experience requiring no pre-requisites. Geology 206, Oceans and Nations, addresses human interactions with the ocean and interactions among the world's nations in the ocean environment, satisfying the Ball State Global/International Studies requirement. The unique topical focus lends itself well to a classroom focus on small-group discussion and cooperative learning, and we have maintained these essentials as section enrollments have expanded from 20 in the early 1990's to more than 100 today. Small-group discussion sessions occupy 40% of all classroom time, giving students the opportunity to wrestle with many specific issues of marine law and ocean resource management, and to present positions and policy recommendations to the class at large. The group work provides regular hands-on practice integrating scientific understanding with cultural, political, and economic considerations, as well as exposure to the bases for divergent viewpoints. Factors important to the success of the course have included worksheet-based discussions, a seating chart incorporating permanent small discussion groups, monitoring of group performance by a student assistant, varied format of group reports, and a significant component of discussion-related material on tests. This report discusses how we developed and implemented an interactive upper division/graduate level class project based on a fictional trichloroethylene contamination incident as part of our spring-2003 semester hydrogeology curriculum at Syracuse University. The "truth" of the contamination was based on a hypothetical Visual MODFLOW and MT3D computer simulation of groundwater flow and contaminant transport. The class was divided into three consulting groups. One provided expert services to people living in a town ("Orangetown") whose drinking water had been contaminated. The other two groups provided expert services to two fictitious manufacturing companies accused of responsibility for the contamination. The consulting groups prepared environmental assessment and contaminant characterization reports on different, fixed mock budgets. The culmination of the project was a daylong mock trial. Lawyers represented the three consulting groups (one real lawyer and two senior consulting hydrogeologists with extensive trial experience) and a jury of lay people decided the outcome. The overall exercise substantially increased the students' attention and interest in the material, as well as their examination performance in the course. Future iterations of the Orangetown Project may be integrated with courses in Maxwell School of Citizenship and Public Affairs, S.I. Newhouse School of Public Communications, and the Syacuse University College of Law. The concept of strike and dip is integral to field studies in geology, but can be challenging and frustrating for students to learn. A simple and inexpensive field tool has proven effective in helping students understand the relationship between the strike and dip of planar geologic structures. This tool can also illustrate the relationship between true dip and apparent dip, and serve as an aide to field measurements of linear structures. The use of this tool with a transit compass can help students make the transition from a conceptual understanding to the actual measurement and collection of structural data. Introductory courses have received most of the attention in efforts to improve the learning environment in college science courses, but upper-level courses also benefit from a focus on learning goals and the use of alternative teaching methods. For a junior/senior geochemistry course I have successfully incorporated various methods of cooperative learning, including group analysis of questions or problems during class time, and long-term collaborative projects. Traditional exams have been replaced by frequent assignments, project reports, oral presentations and a reflective course summary. Student feedback, achievement, and course evaluations indicate that students reach higher levels of learning and satisfaction that bode well for long-term retention of concepts. The data suggest that working collaboratively during class, discussing homework in class before the due date, and giving regular, timely feedback on assignments are the main reasons for the positive outcomes. The primary research literature can often be a valuable supplement to undergraduate textbook and classroom activities, particularly for in-depth exploration of conceptually difficult areas of the Geosciences. It is also important for students to develop skills needed to read the literature in preparation for future employment or graduate school. I use guided readings of articles from the primary research literature as a tool to ease introductory and intermediate students into journal articles, as well as a way to teach good habits in journal reading. In Introductory Petrology, an article is assigned that describes the development of eclogite-facies assemblages in shear zones surrounded by metastable granulite-facies gneiss (Austrheim, EPSL 1987). Guiding questions step students through the observations and interpretations in the paper, and help lead them to the larger issues of metastability and polymetamorphism in metamorphic rocks. This approach is easy to implement in both introductory and advanced courses, and helps establish a good framework for subsequent in-class discussion. The study of geologic phenomena by the visually impaired and blind is challenging owing to the dominance of sight-based delivery methods used in geoscience classroom and field studies. By approaching the study of weathering using a comparative tactual analysis, a non-sighted geology student may convey his/her observations regarding physical changes in the textural character of weathered surfaces. Conclusions drawn from one such study have been applied to degradation rates of sidewalks in Lewiston, Michigan, indicating that sidewalks greater that 10 years old exhibit moderate to severe change in their surface character due to weathering. Further, when these tactual environmental observations are compared to common tactually discernible items, a mental picture is conveyed to both the visually impaired and sighted that may facilitate insight toward understanding how visually impaired students conceptualize these and other geologic phenomena. Students enrolling in undergraduate level introductory earth science courses often have little or no science background. For lecture format courses, demonstrations or hands-on activities used to illustrate geologic concepts may be valuable teaching tools to facilitate student learning. Demonstrations using materials with which students have familiarity can be especially effective. We used peanut M&M's??? in a series of classroom demonstrations to illustrate concepts of physical and chemical weathering, sediment transportation, and deposition. Student response to this and other demonstrations has been favorable. The demonstrations have fostered student interest in lectures. Results from student learning surveys indicate that most students found such classroom demonstrations aided their understanding of the course material. In particular, when asked about specific aspects of the course and the relationship to learning, most students considered physical activities to be more effective in their learning than other course-related activities such as reading the textbook or working on non-physical group activities. Quantitative literacy (a basic familiarity with numbers, arithmetic and graphs) and quantitative reasoning (the application of logic to problems and the ability to understand the real-world meaning of numbers and mathematical statements) are end-members of a continuous spectrum of quantitative concepts. Introductory geology courses fall within the center of the spectrum. They deal with a world that is complex and chaotic, irreducible to algorithms. For example, probability is a concept that is essential to reasoning in geology, but it is not commonly expressed numerically. Rather, it is expressed and evaluated by appeal to logical argument. Weighing data and appreciating implications of scale, location and spatial relationships are critical in tackling geology problems, and one could argue that in a cross-curricular quantitative reasoning program these aspects of quantitative reasoning may be best delivered through introductory earth science courses.